The cockerel crows its croaked song and you wake up with a yawn and a stretch, your little sister still peacefully snoring away in the bunk bed beneath you. Silently you climb down the little steps and give her a push — you know it’s going to take her at least another ten minutes to properly wake up. You slip a jumper on — it’s cold now, winter has set in — and head outside to start sweeping the leaves off the courtyard of your small village house, which the wind blew all over the previous night. Then it’s the dishes from dinner last night, washing as quickly as you can with the cold water your cousin has just fetched from the borehole. And while you’re squatting on the floor soaping and rinsing the plates, a single, perfectly round drop of red red blood falls between your feet. It’s that time again, and you think in horror at the ordeal that drop means. This has only started recently so you are still unsure how exactly it works, how often it is supposed to happen, how long it should last for and how not to make a mess of yourself once a month. Your grandma has told you about it, and that it means you’re a woman now — but you are only fourteen and the last thing you want right now is being a woman. Quickly you bunch up your skirt between your legs and you go to your bedroom to find some old piece of cloth to stuff in your knickers. You check your skirt all over and luckily it’s spot free, so you go back to the dishes and mentally prepare for the tragedy of walking forty-five minutes to school with the uncomfortable cloth stuck between your legs, and the constant fear of getting stained and having to endure the boys’ bullying at school. This is what most girls in Malawi have to go through monthly when their period comes, forced by expensive pads to use any old piece of chitenje (local fabric) folded over and bunched up in their underwear. Aside from being completely impractical, it meas girls and women go about their daily, very active lives with a moist package in their underwear, which at best is going to move around and stain their clothes, and at worst is going to rub their skin and lead to ulcerations and infections. If being a woman wasn’t hard enough because of cultural and societal expectations, being a woman on your period is nothing short of hellish. Many young girls end up missing whole weeks of school because they are afraid of being made fun of and bullied. And if they do get to school, they often don’t have any running water or private facilities to get changed and manage their menstruation in a safe and dignified way. Much like in other parts of the world, blood is still a very taboo topic in rural Malawi, and menstruation is hardly spoken about. Yet in the close-knitted, communal way of living of many Malawian villages, starting your period is not really a private matter. Because there is no waste disposal, used sanitary pads are burnt with the rest of the rubbish, and let’s face it — burning bloodied plastic doesn’t smell nice. Once it happens the first time, pretty much the whole village will know. So a girl is suddenly thrown into womanhood and sadly becomes a baby-making machine pretty much immediately, with teenage marriage and pregnancy rates still scarily high. Is all hope lost then? Not really. 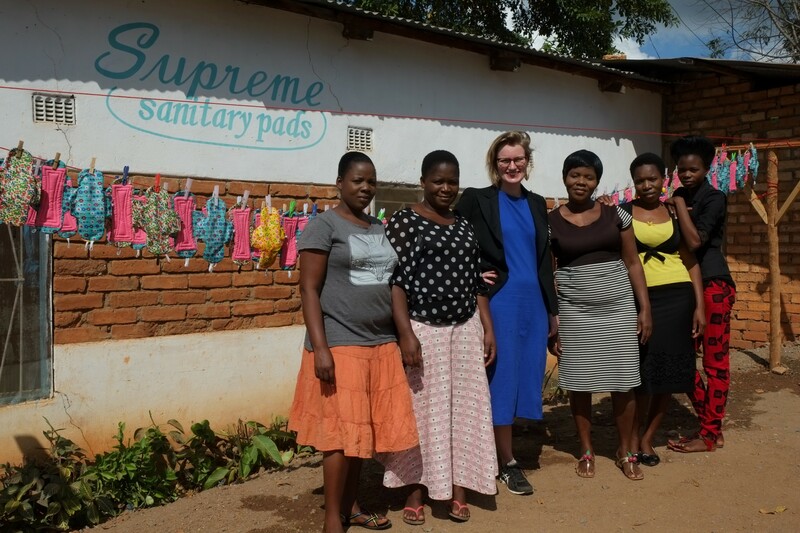 Enter Supreme Malawi, a social business whose main focus is the production and sale of reusable sanitary pads, with the goal of making them as accessible as possible in a sustainable way. “That means we are not donor-funded, and we run ourselves as a business”, explains Managing Director Evelien Post. “But we’re in it for the social impact, not the profit. 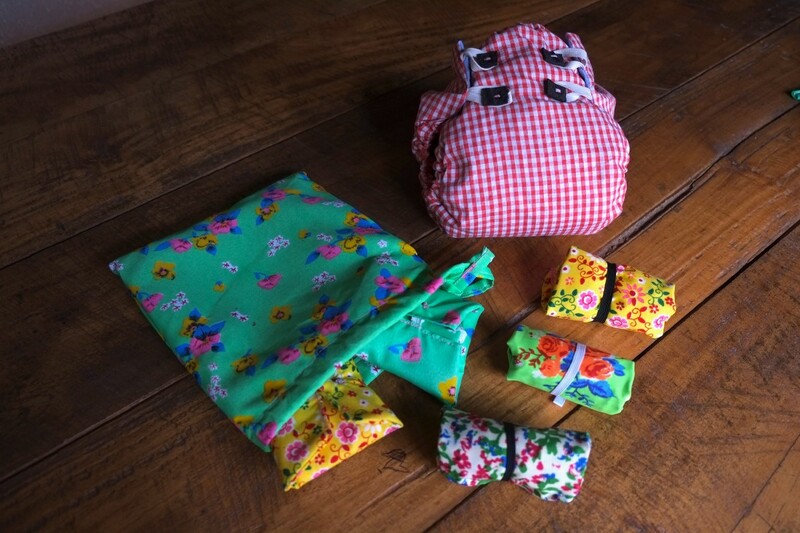 Every penny we make selling the pads to big NGOs enables us to sell our products to local customers at a discounted price, and all the profit we make is immediately re-invested in the business to support our charitable activities”. Supreme regularly visits rural schools and communities around Nkhata Bay, where they are based, to teach girls about menstrual health education, and how to make homemade pads using materials they have readily available: fabric, plastic, any kind of absorbent material like foam or and old towel, scissors, pen, needle and thread, as well as providing patterns they can use to cut and sew their own pads. 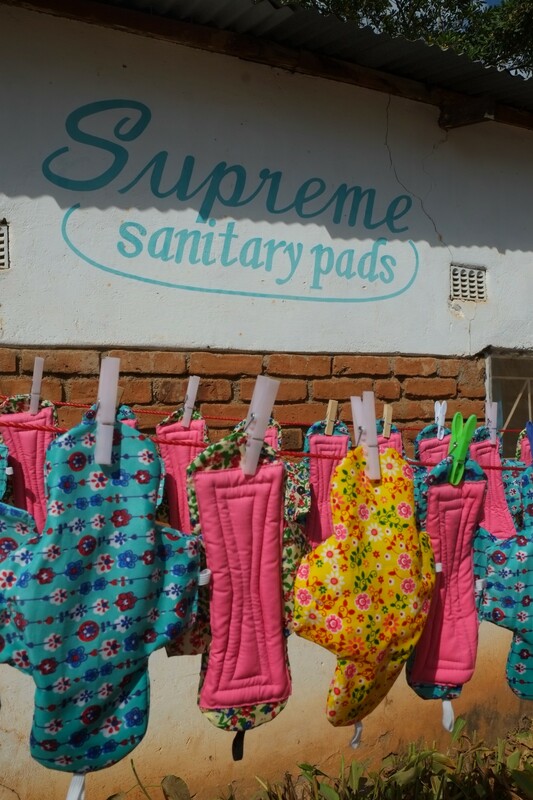 This helps the most vulnerable communities, where families wouldn’t even be able to spare a few thousand kwacha to buy the pads from Supreme. Founders Hanne van Beek and Floris van der Stoep recognised the need for such a product following market research they conducted on the territory as part of a microloan foundation programme. They understood girls and women have a hard time with their period, ultimately because of their poverty and the un-accessibility of proper products to manage your menstruation. “So everything we do needs to keep this in mind — we don’t want to just import a product and give it away for free, we want to empower the local community and make them part of the whole process, tackling poverty at the same time” continues Evelien. This means the pads are entirely produced with locally available materials, down to the buttons which help secure them in your underwear, made from recycled car tyres. 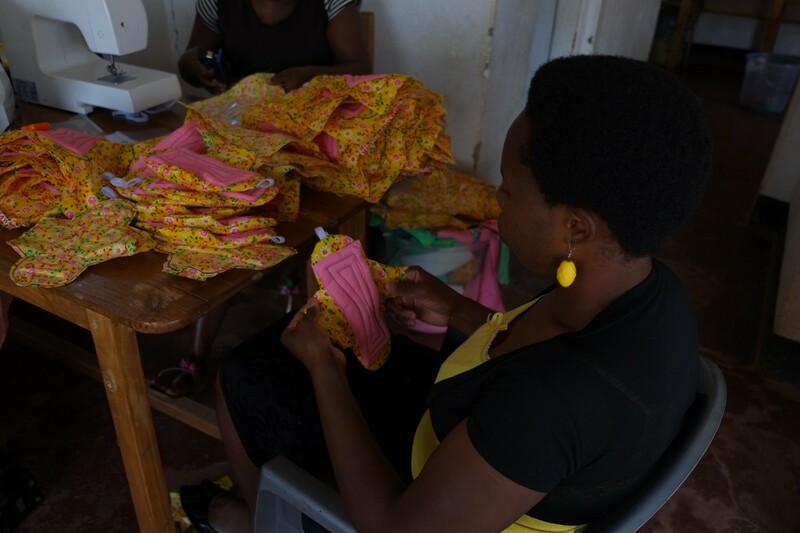 The pads are made by an extraordinary team of five women who have all been trained up as tailors by Supreme, meaning five families are being supported through their jobs. Needless to say, they all use the pads and are really happy about them — thus, the producer has become the end consumer, in a well oiled machine which supports the local economy. One of the women is Emilia, who has been working with Supreme since its early days. 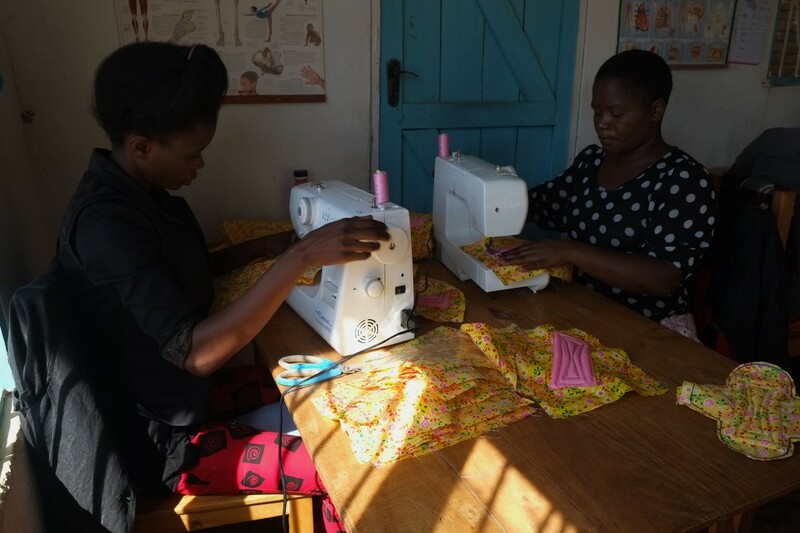 Having seen the advert for a tailoring training program, she applied and got the job, and was trained by Supreme in all aspects of tailoring, as well as being taught about menstrual health and its management. Emilia explains Supreme have a vast range of products, including reusable nappies, urine loss pads and post-labour pads; but the most popular is the school girl pack, which features two maxi and two medium pads, a bar of soap and two pairs of underwear. This is the product which Supreme often brings to schools, and Beatrice, the latest addition to the team, is one of the people who speaks to school girls about menstrual health, how to manage their period and make their own pads. 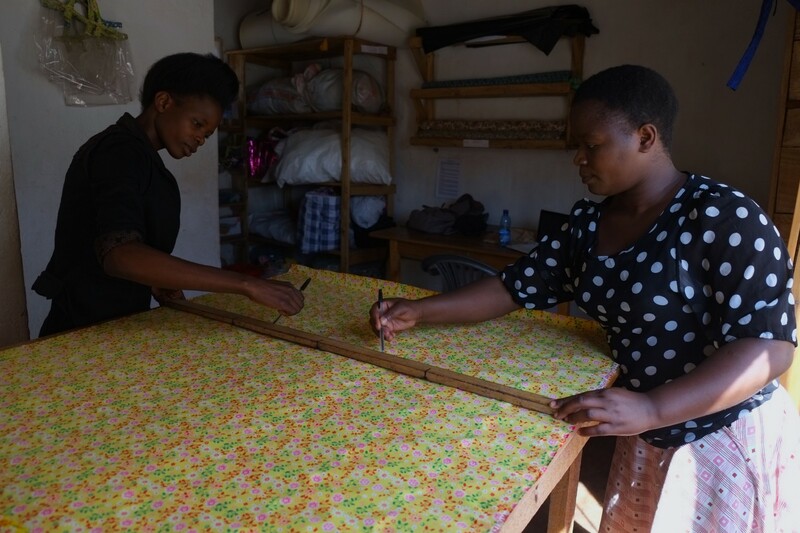 Before working for Supreme, Beatrice used to sell fish door to door, and that’s how she met Evelien, who told her about Supreme and the tailoring training. And Supreme certainly is on the way to big things — far from being just a charity and firmly moving out of the start-up phase, the business is growing ever faster, with tens of orders coming in weekly. “We want to set a national standard in menstrual health management, so that we can open the market more to ourselves as well as other businesses. We want to see our pads in every supermarket and pharmacy in every corner of Malawi, and even incorporate making your own pads in Arts & Crafts school curricula” continues Evelien. And having been living in a rural village in Malawi for the last six months and using Supreme pads, I have no doubt they will get there very soon. If you would like to know more about Supreme, including ways to help, head to their website, or follow them on Facebook or Instagram. Essere una ragazza in Malawi è diventato semplicemente… Supreme. Il gallo canta la sua canzone gracchiante e tu ti svegli tra uno sbadiglio e uno stiracchiamento, mentre la tua sorellina sta ancora ronfando beatamente nel letto a castello sotto di te. Scendi silenziosamente gli scalini e le dai una scossa — sai bene che le serviranno almeno altri dieci minuti per svegliarsi del tutto. T’infili un maglione — fa freddo adesso, l’inverno ha preso piede — e vai fuori per cominciare a spazzar via le foglie dal cortile della tua casa di villaggio, che il vento ha sparpagliato ovunque durante la notte. Poi ci sono i piatti della cena, da lavare più alla svelta possibile con l’acqua fredda che tua cugina è appena andata a prendere dal pozzo. E mentre stai accovacciata sul pavimento, ad insaponare e sciacquare i piatti, un’unica goccia perfettamente rotonda di sangue rossissimo cade in mezzo ai tuoi piedi. È di nuovo quel momento, e tu pensi con orrore al calvario che quella goccia rappresenta. Questa faccenda è cominciata solo di recente, quindi ti senti ancora poco certa di come funzioni esattamente, di quanto spesso sia presumibile che accada, quanto a lungo debba durare e come non gettarti nello scompiglio una volta al mese. Tua nonna te ne ha parlato, dicendoti come ciò significhi che ora sei una donna — ma tu hai solo quattordici anni, ed essere una donna è proprio l’ultima cosa che vorresti in questo momento. Di corsa tiri su la gonna e l’arrotoli tra le gambe, poi vai nella tua camera per trovare qualche vecchio pezzo di stoffa per imbottirti le mutandine. Controlli accuratamente la gonna e per fortuna vedi che non è macchiata, così puoi tornare ai piatti e prepararti mentalmente alla tragedia del dover camminare quarantacinque minuti fino a scuola, con quello scomodo straccio incastrato fra le gambe e il timore costante di macchiarsi e dover fronteggiare lo sbeffeggiamento dei ragazzi. Tutto questo è ciò che la maggior parte delle ragazze in Malawi deve sopportare ogni mese, quando arrivano per loro le mestruazioni e sono costrette dall’elevato costo degli assorbenti ad usare una qualunque vecchia pezza di chitenje (un tessuto locale), ripiegata e pressata nelle mutande. Oltre ad essere del tutto privo di praticità, ciò significa che le ragazze e le donne devono attraversare la loro vita quotidiana, molto attiva, con un’imbottitura umida nelle mutande che nel migliore dei casi si sposta e macchia i vestiti; ma nel peggiore, a causa dello sfregamento sulla pelle, porta a ulcerazioni e infezioni. Se essere una donna non era già abbastanza difficile a causa delle aspettative culturali e sociali, essere una donna durante il ciclo è niente meno che infernale. Molte ragazzine finiscono col perdere intere settimane di scuola per il timore di essere prese in giro e sottoposte a soprusi. E seppure arrivano a scuola, spesso non hanno a disposizione acqua corrente o un ambiente riservato per cambiarsi e fronteggiare le mestruazioni in modo sicuro e dignitoso. Come in altre parti del mondo, il sangue è ancora un argomento molto tabù nel Malawi rurale e delle mestruazioni si parla a malapena — sebbene nel modo di vivere di molti villaggi del Malawi, strettamente intrecciato e comunitario, l’inizio del ciclo non sia affatto una faccenda privata. Dato che non esiste uno smaltimento dei rifiuti, gli assorbenti usati vengono bruciati con il resto della spazzatura, e ammettiamolo: bruciare della plastica insanguinata non emette un buon odore. Una volta che succede la prima volta, più o meno l’intero villaggio lo viene a sapere quasi subito. Così una ragazza si ritrova improvvisamente scaraventata nella sua piena femminilità, e diventa più o meno immediatamente una macchina per fare bambini, con percentuali di matrimonio e gravidanza durante l’adolescenza ancora spaventosamente alte. Quindi non c’è davvero speranza? Non esattamente. Entra in scena Supreme Malawi, un’impresa sociale i cui scopi principali sono la produzione e la vendita di assorbenti riutilizzabili, con l’obiettivo di renderli quanto più accessibili possibile ed in modo sostenibile. “Questo significa che non siamo finanziati da donatori, bensì che ci gestiamo in forma d’impresa”, spiega il Direttore Amministrativo Evelien Post. “Ma perseguiamo fini d’impatto sociale, non di profitto. Ogni centesimo che facciamo vendendo gli assorbenti alle grandi ONG ci mette in grado di vendere i nostri prodotti a clienti locali a prezzo scontato; inoltre, tutti i profitti che realizziamo sono immediatamente reinvestiti nell’impresa per sostenere le nostre attività caritatevoli”. Supreme visita regolarmente le scuole e comunità rurali nei dintorni di Nkhata Bay, dove ha la propria sede, per insegnare alle ragazze gli elementi dell’igiene mestruale e come realizzare assorbenti fatti in casa, usando materiali che loro stesse hanno prontamente disponibili: tessuti, plastica e qualunque genere di materiale assorbente come spugne o un vecchio asciugamano, forbici, penna, ago e filo; nonché per fornire modelli che loro possono usare per tagliare e cucire gli assorbenti da sé. Tutto ciò aiuta le comunità più vulnerabili, quelle in cui le famiglie non potrebbero risparmiare nemmeno poche migliaia di kwacha per comprare gli assorbenti da Supreme. I fondatori, Hanne von Beek e Floris van der Stoep, individuarono la necessità di tali prodotti dopo una ricerca di mercato che condussero sul territorio, come parte di un programma per l’istituzione di un microcredito. Capirono che le ragazze e le donne vivevano gravi difficoltà durante il ciclo, a causa della loro povertà e della mancanza di accessibilità a prodotti adeguati per affrontare le mestruazioni. (Didascalia foto: Sopra e sotto: Varie fasi della catena di produzione). “Quindi tutto ciò che facciamo deve tener presente questo aspetto: non vogliamo semplicemente importare un prodotto e darlo via gratuitamente; vogliamo far progredire le comunità locali e renderle parte dell’intero processo, contrastando al tempo stesso la povertà”, prosegue Evelien. Questo significa che gli assorbenti sono interamente prodotti con materiali disponibili localmente; perfino i bottoni che servono ad assicurarli alle mutande sono fabbricati riciclando copertoni di automobili. Gli assorbenti sono realizzati da una straordinaria squadra di cinque donne, tutte addestrate ai lavori di sartoria da Supreme; e questo significa che cinque famiglie trovano sostegno nel loro impiego. Manco a dirlo, tutte loro usano gli assorbenti e ne sono davvero contente — così il produttore è diventato anche l’utente finale, in un meccanismo ben oliato che sostiene l’economia locale. Una delle donne è Emilia, che ha lavorato con Supreme fin dai suoi primi giorni di attività. Aveva visto la pubblicità di un programma d’apprendistato alla sartoria e fatto domanda; ottenuto il posto, è stata addestrata da Supreme in tutti gli aspetti della sartoria, oltre a ricevere insegnamenti sull’igiene mestruale e sul suo controllo. (Didascalia foto: Gli assorbenti sono stati appesi all’aperto per asciugare, prima di essere confezionati per la vendita). Essendo la più anziana e più esperta del gruppo, Emilia è coinvolta in tutti gli aspetti della linea di produzione, dal disegno dei modelli al taglio, dalla cucitura al lavaggio e alla confezione degli assorbenti. “Gli assorbenti riutilizzabili sono così importanti in Malawi, poiché così tante donne usano ancora vecchi stracci, carta o perfino foglie di banana! E si possono riutilizzare fino ad un anno, così sono migliori anche per l’ambiente”. Emilia spiega che Supreme ha un’ampia gamma di prodotti, compresi pannolini riutilizzabili per bambini, pannolini per perdite urinarie e assorbenti per il dopo-parto; ma la più popolare è la confezione per studentessa, che contiene due assorbenti maxi e due medi, una saponetta e due paia di mutandine. È questo il prodotto che Supreme spesso porta nelle scuole. Beatrice, l’ultima arrivata del gruppo, è una delle persone che parla d’igiene mestruale alle studentesse, di come gestire il loro ciclo e fabbricare i propri assorbenti. Prima di lavorare per Supreme, Beatrice vendeva pesce porta a porta; ed è così che ha conosciuto Evelien, la quale le parlò di Supreme e dell’addestramento in sartoria. “La mia vita è del tutto diversa, ora. Quando vendevo pesce dovevo camminare porta a porta con il pesce sulla testa e il mio bambino legato dietro la schiena, andando dal mercato, giù in città, su per tutta la strada fino al villaggio di Chikale. Oltretutto quello è un lavoro stagionale: in estate non c’è pesce a sufficienza, e questo vuol dire niente affari. Mentre ora ricevo una paga ogni mese, e posso mettere a scuola i miei tre bambini e mio fratello”. Lei stessa convinta utilizzatrice degli assorbenti, Beatrice spiega che sono molto più naturali ed ecologici di quelli a perdere — nessun prodotto chimico nocivo per fargli avere un buon odore, né plastica e colle molto inquinanti. Vittima di soprusi da parte dei bulli quando era più giovane, Beatrice non raccomanderà mai abbastanza gli assorbenti. “Quando indosso un assorbente, non dubito di me stessa e mi sento molto al sicuro”. È anche una Rappresentante per l’Assistenza ai Clienti, quindi viaggia nei dintorni vendendo i prodotti e commercializzando Supreme direttamente ad una vasta cerchia di persone. La promozione e la vendita sono ciò che più le piace del lavoro; infatti nutre grandi speranze per il futuro di Supreme: “Spero che Supreme possa crescere sempre più e fare milioni di vendite, perché so che se ciò avviene non sarò più quello che sono ora”. E Supreme è certamente sulla buona strada per grandi cose — ben lontana dall’essere soltanto una struttura di beneficenza, e decisamente fuori dalla fase di startup, l’impresa sta crescendo sempre più alla svelta, con decine di ordini che arrivano ogni settimana. “Vogliamo gettare le basi per uno standard nazionale nella gestione dell’igiene mestruale, così da poter aprire il mercato ancor di più per noi stessi e per altre imprese. Vogliamo vedere i nostri assorbenti in ogni supermercato e farmacia, in ogni angolo del Malawi, e perfino veder inclusa la fabbricazione in proprio degli assorbenti nel curriculum delle scuole di Arti e Mestieri” prosegue Evelien. Dopo esser vissuta in un villaggio rurale del Malawi negli ultimi sei mesi, ed usando io stessa gli assorbenti di Supreme, non ho alcun dubbio che molto presto ci arriveranno. Se volete sapere di più riguardo a Supreme, e conoscere i modi per aiutarli, indirizzatevi al loro sito, oppure seguiteli su Facebook o Instagram. ariannameschia.com • I travel, I take pictures, I write. • Overlanding through East Africa and Europe. Quit my job, sold what I owned. Here’s what’s next. // All stories are in English and Italian, so reading times are half!